What is Amazon Pay Per Click Advertising? Amazon provides a facility that boost up your product selling through the Amazon Pay Per Click (PPC) module. You can promote your products on targeted keywords by submitting competitive bids for a particular keyword. How Amazon Pay Per Click (PPC) Works? How Can We Help You With Amazon PPC Management? First, this process is harder than you may think. It requires constant observation as competition on the bid keeps on evolving. 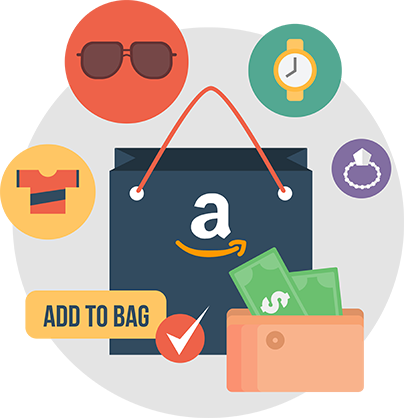 We provide the best Amazon PPC Management Services that cover all the major aspects of your campaign and hence lifting up your sales on Amazon. Connect with us to know how we can help you lift up your product sales on Amazon. We work on customized Amazon PPC Management strategies that are specially designed for our clients. Can we discuss your next Amazon PPC Campaign? What is our process of Amazon PPC Service? Figuring out the set of keywords that are best suitable for the client according to the budget. Product page optimization on the initial level. Setting up the PPC Campaign. Trying out new effective keywords during the process that can lift up the revenue. Providing progress reports on each stage of the campaign. 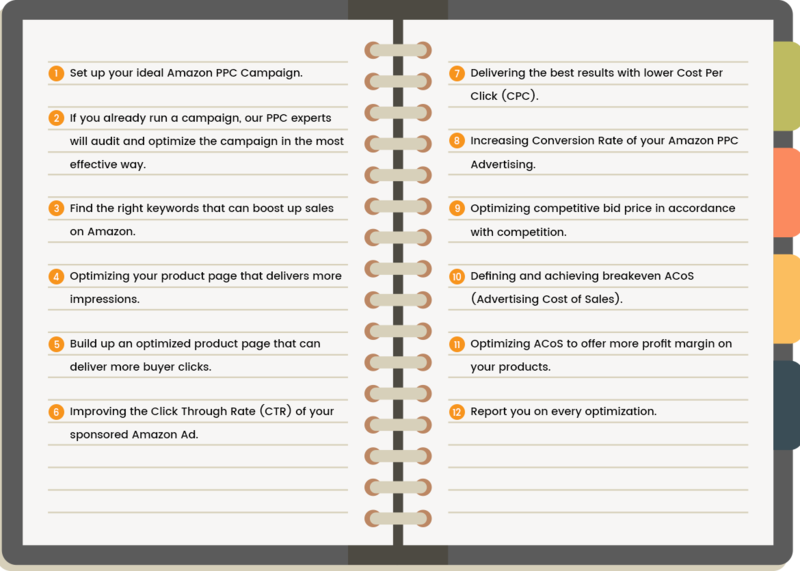 What are the main benefits of running an Amazon PPC Campaign? Relevant Traffic: Ads are shown to the shoppers who has searched on the keywords that you have made a bid. Hence, You will get the relevant traffic. Higher Conversion Rate: Relevant traffic increases the chances of conversion. Organic Rankings on Amazon: Eventually it helps in improving your product rankings on Amazon. Low Spending: Amazon will charge you only when a shopper clicks on your Sponsored Ad. No extra money is spent to run your product advertisements. Track ROI: Amazon allows you to track and measure your campaign, so you can effectively analyse your Return On Investment. Who is eligible for the Amazon PPC Campaign? Any seller who is registered with Amazon is eligible for the Sponsored Product. But, PPC drives customers quickly compared to normal SEO and hence it is more suitable for the sellers who have enough stocks of the product. Where will be my Amazon Sponsored Product displayed? Amazon Sponsored Products are displayed in several places. On the desktop, the ads can appear above, alongside or below the search result. The ads can also be displayed on the product detail pages. On Mobile, ads can be seen below the search results, and on product detail pages. What type of keyword can I target to get the most benefits in Amazon PPC? Broad Keywords like Leather Jackets or Blue Denims. Phrase Keywords like Jeans for Men or Women T-shirts. Exact match keywords like XL Size Jeans for Men. What is an Amazon PPC Bid? In Amazon Pay Per Click campaign, Bid is the amount sellers are willing to pay on each click from the shoppers. The bid amount is equally proportional to keyword popularity. Connect With Us to discuss every bit on our Amazon SEO Services,and how we can help you with your product!